While the sun is baking us with vengeance, it is time to beat the heat in all possible ways. Cooking with leftover is always fun and challenging. Ladoo kulfi is one such easy and tasty recipe. In our family no one has sweet tooth hence sweets which we get from shop or as a gift should be made less sweeter so that it would not get wasted. 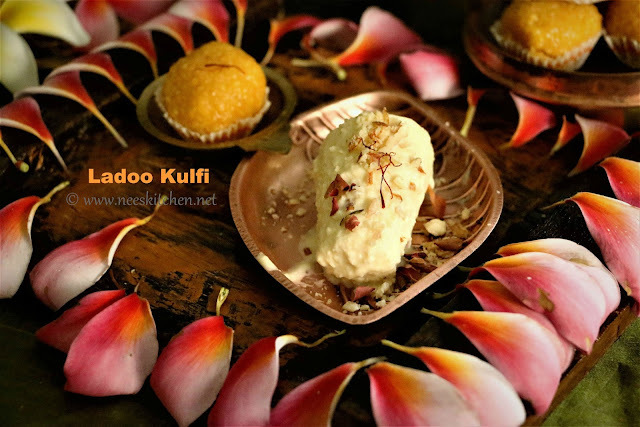 Last week we got a box of ladoo’s and I decided to make ladoo kulfi considering the current season. 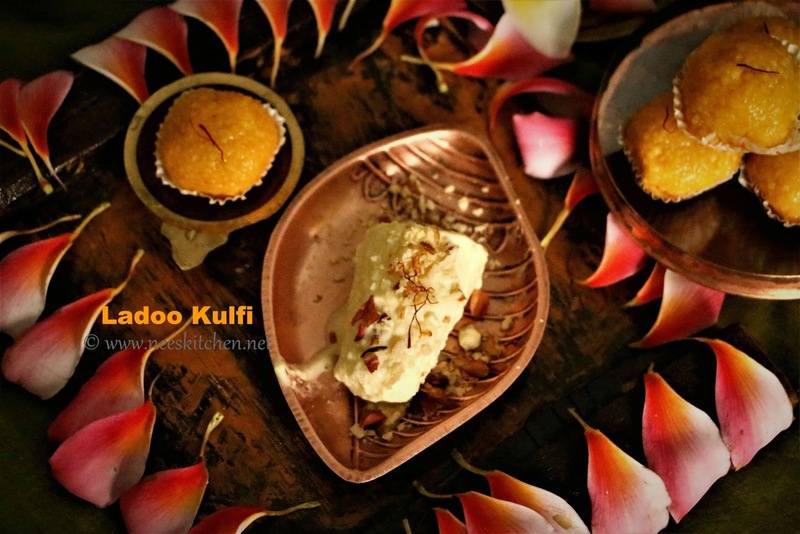 You can also try this recipe during festive season since there would be ample number of sweets. The measurements I have given might be lesser sweeter when compared to regular kulfi. You may add additional sugar in that case. Sugar must be added while you are adding the laddoo’s. Addition of nuts & rose petals are optional for Ladoo Kulfi. Cooling Time : 1 hour 30 minutes. 1. 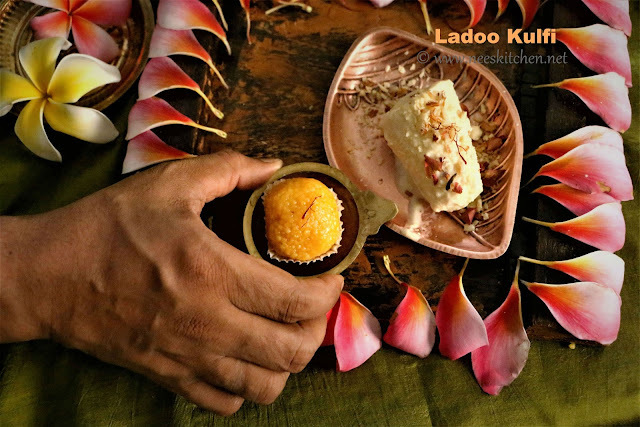 To begin making the Ladoo Kulfi, crumble the ladoo and set aside. 2. Dry roast nuts and pound it in a mortar pestle. 3. Take a heavy bottom vessal and bring the milk to boil. 4. When the milk starts to boil add the laddo. Cook on low flame stirring continuously. This is a time taking process and requires some patience. 6. Turn off flame and allow it to cool. 7. Once it reaches room temperature, place it in fridge for 1 hour so that the ice crystals will not be formed. 8. Take out the chilled mixture and pour them into kulfi mould and close the lids. 9. Freeze for a minimum of 6 hours or overnight and allow it to set in the moulds. 11. Garnish with nuts, rose petals and saffron. 1. Motichoor ladoo can be replaced with any variety of laddoo. 2. If you have added cloves to ladoo, remove it. 3. Addition of sugar is optional and I have not added. 4. 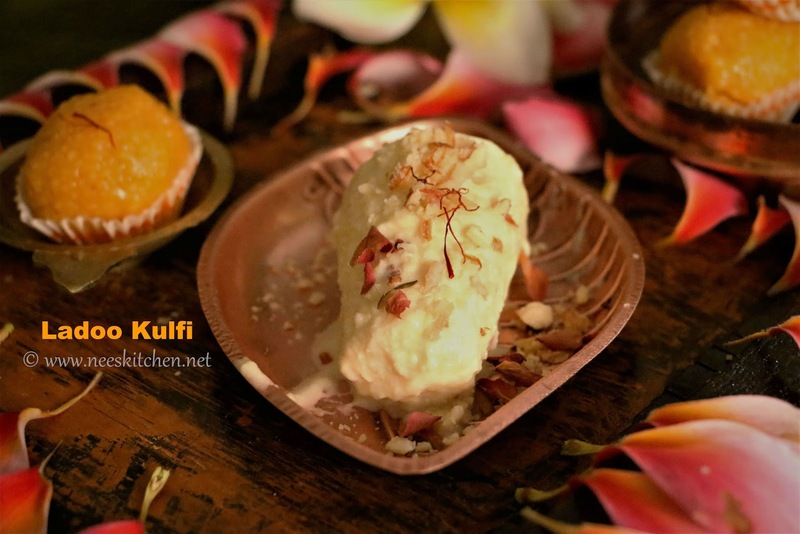 Do not fill the kulfi mould till the brim as the contents would expand while freezing.